Man alive, I'm not a resolution kind-of girl. As I said in my last post, I try not to make "resolutions" each year, mainly because I tend to fail. I'm awesome at the outset and then, about three weeks in, blah. Yet still, I try. My one little word helps. And #nerdlution helps. #nerdlution was a hashtag a bunch of friends came up with last year on Twitter. A set amount of time along with some set goals. Check in as you could on Twitter using the hashtag. (You can read more about it in Franki Sibberson's blog post HERE.) Similar to Linda Urban's #WriteDaily30, which I just finished, I found #nerdlution to be moderately successful. I didn't meet my goals every single day, but it helped me to refocus. For a recent example - I wrote 27 out of 30 days in #WriteDaily30. So while my one little word, grace, will be with me for the year, I'm hoping #nerdlution15 (this year's hashtag) can help me kick off the year with some good habits. I have got to get this one under control. I love soda. LOVE. I could drink it all day, but I don't. I know how bad it is for me. I don't think it is realistic, however, for me to cut it out completely right now. So my goal is one soda a day and at least 64 ounces of water. That would be huge. I have not been exercising of late, and my grouchy mood can attest to that. I don't care what type of exercise it is, but I want to add moving back into my life, four times a week for thirty minutes each time. My guess is that walking will be the main form, which is fine with me. I need to add back some more fruits and vegetables into our diet. With both of my boys in travel basketball, I feel like our eating habits have turned to whatever is the quickest. So nothing drastic, because I know that isn't attainable for me, but a concerted effort to add what fuels us back in. Grace is my one little word for 2015. Someone yesterday asked what grace means to me. I do think of God's grace when I think of that word. I selected it because my interpretation is that it isn't something we need to ask for, but it is the love and mercy that he gives us. I'm picking it as a reminder to be kind to myself this year and making it a #nerdlution to reflect as often as I can on whether I am, indeed, remembering grace. And there you have it, my four #nerdlutions for the first 58 days of 2015. Franki is going for 50 days, but I’m doing 58 as that takes me to the day of my 41st birthday. I can’t think of a better present for myself than that. Want to join in? Use the hashtag #nerdlution15 and we will see you there. It’s that time of year again, time to look back and look ahead. 2014 was a good year. A year where we had some sadness, but also a whole lot to celebrate. I am more certain than ever that time speeds up as you get older, because 2014 seemed to fly! This just makes me all the more aware of the time passing and the desire to hold tight and appreciate it while I can. I try not to make “resolutions” each year, mainly because as I near the end of my 40th year, I know I don’t keep them. Instead, each year I pick my word, my one little word, and focus on that for the next year. It isn’t something I consciously do each day, but it pops up in my mind throughout the year. For 2012 and 2013 I had the word be. Just be. Last year the word was balance. Both words have helped me – to be more comfortable in my own skin, to search for balance when it was gone. I’ve thought a lot about what to pick for this year’s word. There is a lot I would like to accomplish this year, a lot I would like to change, but it begins here, with grace. If you would also like to select a word for your year, please join in! If you need inspiration, here’s a list of words that were selected in 2013 on Ali Edwards’ blog. 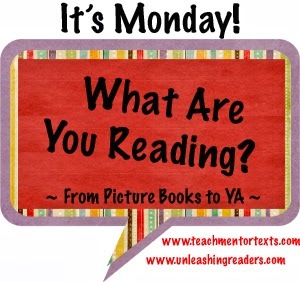 Be sure to visit Teach Mentor Texts and Unleashing Readers to learn more about the link up for It's Monday! What Are You Reading? Today I'm hoping to finish the first book for adults that I've read in forever: Jan Karon's Somewhere Safe, Somebody Good. My mom also gave me The Rent Collector. I'll have to see if I can finish that one as well. And then, who knows! There are seven glorious days left, anything is possible. I’ve been thinking about this tweet since last Sunday. 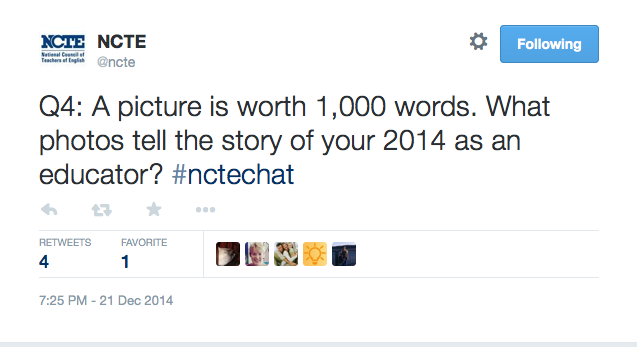 I had family over and couldn’t participate in the NCTE Twitter chat, but did catch up in the archives. I am a visual person and I love photography. If I didn’t spend so much time reading and writing, I know I would put more effort into learning more about photography. Alas, there is only so much time in the day. At any rate, I saw the tweet and grabbed my phone. Currently it is my main camera. I decided to scroll through my photos and settle on one to share here, answering the tweet in a blog post. My only “rule” was that the photos had to be on my camera, not ones I had already saved to my computer. I ended up, of course, with more than one photo, I selected nine. I think this mosaic does a pretty good job of telling my story. I am an educator that shares herself with her students. I plan on blogging on this topic soon, but I strongly believe my students need to know me well to begin to trust me and let me into their lives. In that vein, I share my favorite Christmas movie with my fifth graders each year – Christmas Eve on Sesame Street. I tell them about growing up, watching it each year, and how I still do today. How it brings me back to being a little kid in the safety of my parents’ home. I am an educator who doesn’t leave my passion for children and reading at my classroom door. The most common gift I give at Christmas is books. One can never have enough books. When I learned that my niece, Meredith, hadn’t read Smile or Sisters, I promptly purchased them for Christmas. It was one of my favorite parts of the day when I sat with her on the couch as she devoured Smile and immediately picked up Sisters. What an honor to experience that with her for the first time. I am an educator that wants my students to be themselves. When I hear teachers bemoan chatty kids, restless kids, I do want to scream at times. I think we forget that they are just ten year olds, not mini-adults. Kids need to be kids. Heck, I think we all need a bit more kid in us. The world would likely be a better place. This year I made sure to be an educator who put herself first. (Although I could still improve in this category.) At NCTE one of my absolutely favorite memories will be sightseeing on Thursday morning with Karen. 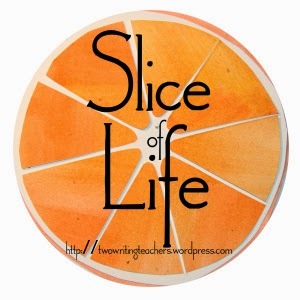 It gave me a chance to connect more with a friend—and with my students! As we went to the sights, I took photos and sent them to my class Twitter account so the kids could see them with me. I am an educator who works hard to develop relationships with all of my students. Sometimes you know it is working, sometimes it takes you by surprise. I stayed home sick this fall with a nasty cold bug. Seeing this tweet from our class account to me brought tears to my eyes. Thanks, Max. I am an educator who works hard to connect kids and authors. I want my students to know how special they are and the potential they have. I wrote on this blog about Lexi’s connection to Kate Messner’s upcoming book. Kate signed a copy to Lexi and I was honored to be able to give it to her. I hope it is a memory she will treasure; I know I will. I am an educator who strongly believes in the importance of reflection. I think this is critical for teachers, I am constantly thinking of what I have done well, how I can improve. I also think my students need to learn to reflect. Often they just say, “I did great…” even when they know they didn’t. I embed reflection throughout the entire year. Here was their cover sheet to their NaNoWriMo pieces from November. They worked on editing in December and then turned it in to me. Since most pieces were over ten pages, I asked them to select one part and tell me why it was the piece they wanted to be graded on. Their answers and reflections fascinated me. I am an educator who respects her students. We took “shelfies” of the books we were going to read over break. One of my students has autism and really does not like to have his picture taken (individually, he’s fine if it’s a group shot.) I know this about him and asked if he wanted me to skip him for the shelfie. He struggled because, as he explained, he wanted to have his picture taken with his book, but he didn’t want to be seen. This was our compromise, he is behind his book. He checked out the picture on my phone and said it worked for him and I was welcome to share it now. I think it is important to honor all of our students and respect what makes them comfortable. And I am an educator who is a Sage through and through. The Sage is our mascot – a wise owl. I have been a Sage since 1984 when I moved to Monticello as a fifth grader. Our superintendent, Dr. Zimmerman, ends every opportunity to speak with this phrase, “It’s a great day to be a Sage.” Last year he gave us these pins, which I immediately attached to my backpack. It is a reminder to me on a daily basis that I am blessed to have the job I have and I need to work hard to give back to this community that has given me so much. And that, in a nutshell, is my story as an educator in 2014. What is yours? 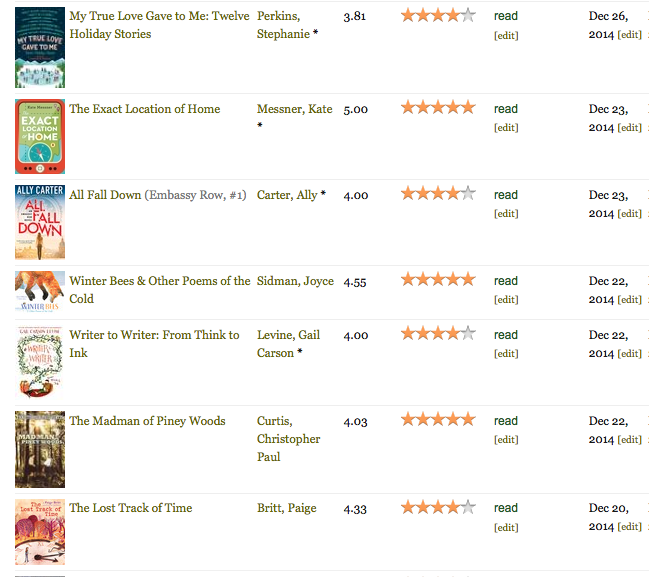 I have been planning my reading for Christmas break for weeks. Books I have long since shelved have resurfaced. Books I've been wanting to get to, yet knowing I had no time, were pulled out and greeted as long lost friends. I had a plan, a plan I say! And yet, today plans went awry. And with that status, my plans changed. See, years ago I read one of Kate's books called The Brilliant Fall of Gianna Z. I immediately fell in love with the characters in that beautiful book: Gianna, her absentmindedness, but her beautiful spirit; her wonderful parents; her increasingly forgetful grandmother; and her friends - Ruby and Zig. So often in books I hate coming to the end, I am so attached to the characters. In Gianna Z., this was absolutely the case. I was left wondering about Gianna, Ruby, and Zig. What happened to them? Were they still friends? And I thought a lot about Zig. I heard through the rumor mill that Kate was writing a follow-up book to Gianna Z. and it would only be available as an ebook. I really, really, don't like reading books on devices, but for this book I knew I would just have to get over that. So, you can see, why Kate's status update required an immediate change in plans. 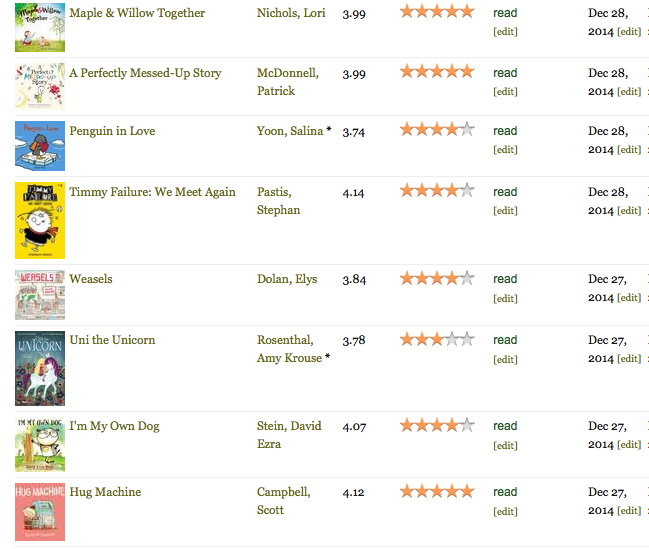 I had just finished Ally Carter's upcoming book All Fall Down and was wondering what to read next. 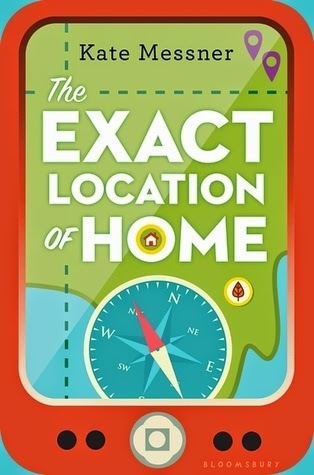 I quickly clicked through to purchase The Exact Location of Home and was off and reading. Although it has been five years since I read Gianna Z., I immediately reconnected with the characters. I loved seeing Gianna (and the others) through Zig's eyes. My heart broke for him as he dealt with increasingly difficult issues at home and at school. At one point I wanted to leap through the book and scream at his teacher. At another point - towards the very last pages - I screamed again, but this time with delight. What a wonderful gift Kate has given her readers, a chance to revisit this wonderful characters. All too soon the book came to a close. As I slid to the last page of the book on my iPhone, I sighed. I wondered if I could bribe Kate to write more for Zig, Gianna, and Ruby. Do you think she'd agree to a monthly email? A newsletter? Probably not. For now, I will just have to pick up Gianna Z and share it with my students. I cannot wait, I know they will be fast friends. This is an easy week to celebrate. Parties at school, Christmas break, time with family - what's not to celebrate? I stayed late every day this week at school, and worked when I got home, so I could have my grading done and grades posted when I left. At home, gifts are purchased and presents are wrapped. We are ready for two weeks of relaxation and time together. I cannot wait. I love celebrating with my fifth graders. They are so excited to give me gifts - and seem to know me pretty well. I got lots of items I could enjoy while reading: warm blankets, beautifully smelling candles, chocolate, hot chocolate, etc. There were beautiful scarves, mugs, gift cards to head out and eat (and not cook!) I also had several items with the Starbucks logo featured prominently, including all of these gift cards. I cannot possibly thank my students and their families enough. They make my job so much easier. I think hard about what book I give my homeroom class, this year it was easy. With the sequel coming out in April, Rump seemed like the perfect gift to give. All of my three classes got the bookmark celebrating the brilliant Brown Girl Dreaming. I hope they might enjoy a little reading time over break. We had our snacks and drinks in the classroom yesterday while watching my favorite Christmas movie of all time - Christmas Eve on Sesame Street. This came out in 1978 when I was four. My family used to watch it every year on PBS. When I moved out as a young adult, I purchased it as a video, replacing it with a DVD as technology changed. My own family has it as required viewing beginning on Thanksgiving night. Each year for the last few years I share it with my students. The simple storyline centers around friendship and kindness. While the kids usually look at me skeptically when I pull out Sesame Street, they laugh and smile as they watch the video. I love sharing this favorite with them. I am celebrating by beginning my holiday #bookaday as soon as I post this blog. I'm going to make some tea and curl up with The Lost Track of Time by Paige Britt. Perfect start to my Saturday. Finally, please enjoy this video from my students and me. Happy Holidays! Today wrapped up one of my favorite units of the year, our Mock Caldecott. For the past three years I have had the pleasure of teaching this unit to my fifth graders while Margie Myers-Culver teaches the same unit to students in her district in Michigan. We select the books at the start together and then don’t really chat again until it is time to announce the winners from each respective class. This we do via Skype. I'm always so excited to see if any of the same books were chosen by our classes. Can you believe it? I've never had the same book "win the gold" in all three of my reading classes!! After our Skype visits with the classes yesterday and today, we had the opportunity to "shop the room" for some books to read over winter break. All in all, a great day. I began this year with a goal—to try and get my students to love writing as much as they do reading. I think I have always done a decent job with reading, you see. Writing? It really varied from year to year. And so, I have worked hard at it. We’ve written daily, had lots of discussion around what we wrote, focused quite a bit on free choice, and I’ve tried hard to make sure they see the purpose of writing. One area I have emphasized over and over is that their writing is for them. Sure, they might need to turn something in from time to time. Sometimes we even will do a certain type of writing and that will be graded, but their notebooks are theirs. I don’t see them most of the time. We’ve talked about what type of writing can go in there, how sketching is encouraged, etc. Something I addressed again and again is that writing can help us heal. As much as I would love my fifth graders to have wonderful and carefree lives with no stress, pain, or hurt, I know that simply isn’t true. So we have talked about how when we are hurting, we can write about it. We can write about it simply, just write what is on our minds. We can use our feelings to inspire our writing, or maybe even a poem. Over the years I have seen many poems about divorce, loss of a pet, friendship troubles. There has been writing about fear—students losing their homes, losing a grandparent, or the fear of not measuring up. I never ask to read this writing, of course. Writing is personal and it belongs to the writer unless they are ready and willing to share it. Today we began class as we often do, with a quick write. For the month of December we’ve been sharing a haiku a day from the picture book Santa Clauses: Short Poems from the North Pole by Bob Raczka. After reading today’s haiku, I also shared one from my friend, Mary Lee. She had written one entitled Grief. Why would Mary Lee write about this? What makes a haiku a perfect form for this writing? Do you ever turn to poetry versus prose to express strong emotions? After asking my students to think about these questions—and each class also had their own conversation beyond those—we then turned to our notebooks to write for two minutes. Just two minutes to capture our thinking at the time. I glanced around the room as each class wrote. I watched some students bopping their heads, fingers splayed out as they counted syllables. I saw some serious faces as students were curled around their notebooks, pencils clutched tightly in their hands. And I saw some students glance at me, give a shy smile or a shrug, and turn back to their notebook. I hope with everything in me that they get the habit of writing instilled in them during our year together. I know that as they move forward in life that the simple act of writing your thoughts and feelings can be a huge blessing. The act of rereading your writing allows you to reflect and grow as you go forth. Watching my young writers today I was filled with hope. Right now, they seem to truly get it. That simple fact makes me smile. With that, I picked up my pen and joined them. Deep breaths, just write. Last week I finished up Egg & Spoon. I told my students I wasn't even sure where to begin explaining that beautiful book. There is the Russian fairy tales that are woven in, Baba Yaga for example. There is the peasant girl and a girl from a noble family. There is the Tsar, the egg, the talking cat. My head was spinning. By the end, I loved the book. The first half, I only liked it. I absolutely grew more attached as I read. A good lesson for my students, and for me. I also read a beautiful book of Christmas Stories from Cynthia Rylant that Margie Myers-Culver sent me. Thanks, Margie! This week I’m reading an ARC from NCTE. Five days until break and then I will begin holiday #bookaday!